The Department of Defense provided the funding this month to seed the Center for Adaptive Supercomputing Software, a joint project between the Department of Energy's Pacific Northwest National Laboratory and Cray, Inc, in Seattle that will develop innovative software for advanced supercomputers. 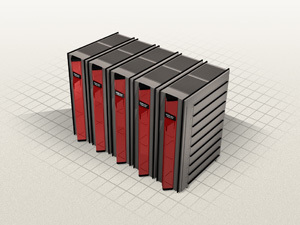 The Center for Advanced Supercomputing Software will take advantage of the multithreaded processors in the Cray XMT. Image courtesy of Cray, Inc. The newest breed of supercomputers have hardware set up not just for speed, but also to better tackle large networks of seemingly random data. And now, a multi-institutional group of researchers has been awarded $4.0 million to develop software for these supercomputers. Applications include anywhere complex webs of information can be found: from internet security and power grid stability to complex biological networks. The difference between the new breed and traditional supercomputers is how they access data, a difference that significantly increases computing power. But old software won't run on the new hardware any more than a PC program will run on a Mac. So, "The system will allow much faster analysis of complex problems, like understanding and predicting how the power grid behaves—one of the most complex engineering systems ever built," said Moe Khaleel, director of Computational Sciences and Mathematics at PNNL, which is leading the project. Other researchers in the software collaboration hail from Sandia National Laboratories, Georgia Institute of Technology, Washington State University and the University of Delaware.